Enterprise and service providers are seeking solutions to their networking challenges today and want their networks to adjust and respond dynamically while being in line with their business policies. An impetus on optimizing operational costs of running a network requires embracing automation and reducing manual effort. In addition, being able to easily deploy and run applications on their networks is a tall order and no single point solution can address all these needs. Happiest Minds is committed to supporting OEMs, ISVs, Service Providers, Web Scale & Enterprises in the design, development and deployment of Software Defined Networking, Network Function Virtualization, Software Defined Storage & Cloud Storage. We also test, validate and provide test automation frameworks and accelerators covering both SDN and NFV. We provide the complete Test cycle services from Test requirements to deployment and support. In addition, our expertise across 3rd platform technologies like IoT and Analytics enables us to offer incremental value across the technology landscape. Headquartered in Bangalore, India, Happiest Minds has operations in the US, UK, Australia, Middle East and Turkey. Our key investors are J P Morgan Private Equity Group, Intel Capital and Ashok Soota. The need for business agility, scale, everything as a service (XaaS) has led to several disruptions in the way network services are delivered. We have seen the transition from physical machines to virtual machines and then to containers. More recently, we have actively worked with acceleration technologies like DPDK and NIC offload, embraced ASICS and programming models like P4 and developed solutions using Intent Based Networks. Design and Development of VNFs Enhancement of VNFs Performance tuning and optimization using technologies like DPDK, PFRING, SRIOV etc. Virtualization, Containerization VNF MANO Development of VNF Management Applications and Systems Integration with Open Source and 3rd party software VNFM, VNFO like Tacker, Cloudify etc. Integration with NMS/OSS systems. Evolving from the separation of the control and data plane and openness, SDN has now come into its own, enabling critical functions like orchestration, provisioning and intent based networking. An SDN solution is an integral component in Telco Cloud NFV solutions, SD-WAN solutions and Enterprise data centers. We are now dealing with an ecosystem where we have open as well as proprietary solutions co-existing with pure play SDN and hybrid SDN solutions. Development of SDN Applications and features. 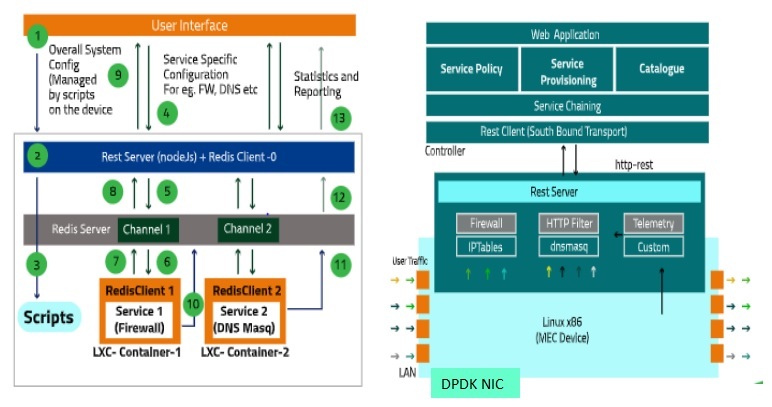 Integration with commercial and open source SDN controllers Integration with Portals, EMS / NMS systems. Test Automation frameworks for functional and conformance testing. Multi-protocol testing - OpenFlow, NetConf, OVSDB, P4 Runtime etc. E2E system testing including Network Intents, Orchestration, Application, Controllers and network elements. The Telecom Industry is currently undergoing a complete transformation to maintain its competitive advantage, as expectations of a seamless digital experience increase from enterprises as well as consumers. Telecom players are now focused on leveraging disruptive technologies such as Open Programmable Networks, SDN, NFV and Analytics to create low latency, high performance networks. The end goal is for these networks to come through on the demands of scale and quality on one hand, while bringing in 3rd Platform technologies like Cloud, Mobility, IOT, Big Data & Analytics on the other to create a strong application eco-system and maximize the full potential of B2B2X. Happiest Minds can assist Telecom Service Providers in this journey with our expertise in SDN, NFV, IOT, Analytics and DevOps. SDN-NFV Test Framework – A keyword driven, model based test framework with auto test case generation capabilities and rich library of test cases. E2E VNF Test Framework - Model based test framework for pre-certification level testing including VNF functionality, VNF lifecycle management and NFV MANO testing. Multi access edge computing is a compute and network architecture concept that enables cloud computing capabilities and an IT services environment at the edge of a mobile network. Multi access edge computing is also an emerging technology that lets operators host content and applications close to the edge of the network. MEC brings new levels of performance and access to mobile, wireless, and wired networks. The technology has the potential to upgrade today’s networking environment and evolve the market quickly into the IoT future. With Happiest Minds’ framework for multi access edge computing powered by Intel processors, it is easy to demonstrate the aspect of service deployment and configuration and also provide solution acceleration which can be easily customized to develop a complete end to end MEC infrastructure or develop individual components. The orchestrator provides the functionality for provisioning of deployment and chaining of services based on a service catalogue and user preference. The service catalogue contains software application information for multiple types of applications. Here we have an option for the user to select a specific software. For example, one can choose Firewall application implementation based on IP-tables, OVS, Fortinet etc. Additional provisioning includes the configuration of individual services Eg: five-tuple rules for Firewall, Blacklisted URL for an HTTP filter etc. The MEC device contains a modular software architecture which can be easily upgraded to support additional VNFs and enhance the overall telemetry by including statistics and reports from the newly added VNF. The VNF runs in a containerized environment using LXC maintaining isolation for its lifecycle management. The above framework paves the way for realizing more complex solutions with multiple use cases containing many more services. MEC Device engineering: Hardware and Network software to manage service deployment, configuring and telemetry. Middleware, Portal & User interface development: MEC controller containing databases and workflow to handle configuration, security, management and telemetry functionalities. Software Integration with Network Orchestration and Automation Platforms and IOT Platforms. Edge Analytics Solution Development: The framework supports gathering service specific statistics and performance metrics which can be used as an intent to generate administrative triggers back to the platform. Edge Application development.